Caravan Guard reports on Winning Ways in motorhome kitchens. The judges deliberated hard at the Caravan Industry Awards 2011 which were judged at the International Caravan and Motorhome Show held at Birmingham’s NEC in October 2010. There were 14 entries for the Motorhome Kitchen of the Year Award, sponsored by Dometic, and a team of experienced motorhome users and journalists walked for miles opening and closing motorhome kitchen cupboards and drawers, checking the height of worktops, checking the stability of shelves and the position of lights and electric sockets. Their brief asks them to look at washing-up facilities, user-friendliness, safety, quality, practicality and finally to consider whether the equipment level is commensurate with the size and price of the motorhome. Kitchens are marked out of 75 points and the standard was reported as being very high this year. The winner was the Starburst by Autocruise and we liked the L shape kitchen with a swing-out storage unit which will give a bit more worktop space too although we thought it restricted access to the kitchen and end washroom. We did like the two-tone locker doors; they are ivory with gloss walnut trim and were impressed with the cold cathode strip light over the sink. The 700w microwave was at an ideal eye-level height and we liked the built-in wine rack. So a worthy winner, we think. 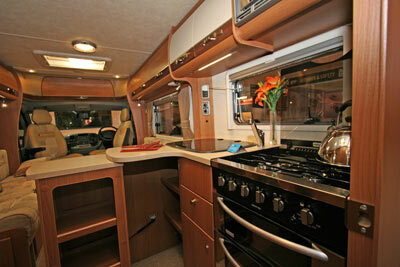 *Motorhome insurance cost based on 2011 Autocruise Starburst valued at £47,987.82. Fitted with Thatcham Category 1 alarm and manufacturers immobiliser, kept at home behind 24 hour locked barrier at TD9 8ED. Motorhome owners – professionals over 50 years old with no claims, convictions or health conditions in last 3 years. 4 years no claims bonus mirrored from car policy and 2 years motorhome driving experience. Members of motorhome club doing less than 7000 miles annually. £250 excess applies. European cover £10 extra, European Breakdown £42 extra. Premiums include insurance premium tax at 5% and are correct as of 15.12.10. 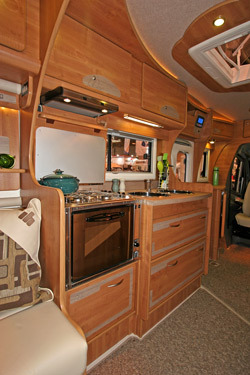 Runner-Up was the J1000, by IH Motorhomes a hand-built model launched in February 2010. There is a choice of worktop finishes and we think the two deep, shiny sinks are a luxury, but the lack of worktop space is compensated for with a lift-up work surface to the right of the sink. This is fine, but we thought that it limited access to the door-hung waste bin. We liked the two deep drawers under the sinks and another under the gas hob. The latter has a lift-up lid with a practical metal splash back, but we weren’t sure if you could safely access the mains power point set above it if the lid was open. 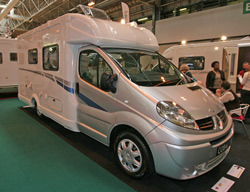 **Motorhome insurance cost based on 2011 IH J1000 valued at £71,806. Fitted with approved tracking device and Thatcham Category 1 alarm and manufacturers immobiliser, kept at home behind 24 hour locked barrier at TD9 8ED. Motorhome owners – professionals over 50 years old with no claims, convictions or health conditions in last 3 years. 4 years no claims bonus mirrored from car policy and 2 years motorhome driving experience. Members of motorhome club doing less than 7000 miles annually. £250 excess applies. European cover £14 extra, European Breakdown £42 extra. Premiums include insurance premium tax at 5% and are correct as of 15.12.10. Have you come across these models, what do you think? Do you agree with the judges’ findings? Have they missed any other classy motorhome kitchens out there? Shows how good this Kitchen layout is exactly the same as in my 2006 Renoir. If it aint broken dont’t fix it. With years of motorhome/camper experience behind us both myself and her that does has yet to see the need and waste fuel carrying an almost domestic sized cooker. If you need more than 3 rings and a small oven rent a country cottage instead. Yet another example of so-called designers not understanding the needs of the regular travelling camper. very taken with the information provided on this review page. will definately switch myinsurance cover toyour company next time ! why is it the brits are so tied to their full sized oven and hob arrangement? Glad to see that the runner up had a more sensibly sized oven. Why is Bentley motorhome pictured instead of IH?